Tree planting held to offset construction carbon emissions from new leisure centre. Wates has planted 100 sapling trees by the new Braywick Park Leisure Centre in order to offset carbon emissions generated during the centre’s construction. 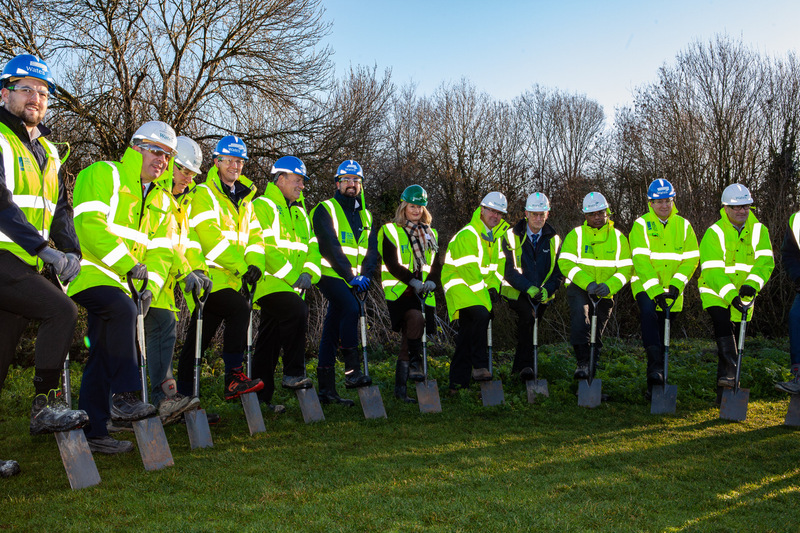 The trees were planted in partnership by Wates Construction and the Royal Borough of Windsor & Maidenhead as part of a commitment to offset carbon emissions created by construction of the new Braywick Leisure Centre. Wates commenced work in October last year to build a brand new leisure facility to replace the 40-year-old Magnet Leisure Centre in Braywick Park. The new centre will boast a 10-lane swimming pool, larger training and splash pools, a larger sports hall, a 200-station gym and four squash courts. The scheme will improve disability access and double the numbers for car parking and will also use 70% less energy than the existing leisure facility. The new trees will aid the creation of a new woodland wildlife habitat while also offsetting the unavoidable carbon emissions caused by vehicles, site machinery and the site office accommodation required to support construction of the new leisure centre. All the trees planted are native British species including Silver Birch, Grey Willow, Whitebeam, Hazel and Hawthorn. Wates is also supporting a wind farm in India through the Carbon Footprint Ltd’s ‘Tree Buddy’ scheme. This will see at least 300 tonnes of carbon dioxide offset with official carbon credits verified against the internationally-recognised Verified Carbon Standard. Cllr Samantha Rayner, lead member for culture and communities at the Royal Borough of Windsor & Maidenhead said: “Ensuring our developments are as environmentally friendly as possible is one of our top priorities. As well as the sapling trees, the building work on the new Braywick Leisure Centre has taken a step forward with the foundation floor for the pool now in place. Cllr Rayner continued: “The Braywick Leisure Centre build is now well underway and it’s wonderful to see the build progress. Works at the Braywick Leisure Centre are being carried out by Wates on behalf of the Royal Borough of Windsor & Maidenhead via Major Works – UK, part of Scape’s National Construction framework. The framework has been designed to deliver significant levels of local economic engagement as well as extensive community initiatives. Mark Robinson, Chief Executive of the Scape Group, added: “It is great to see that Wates and the Royal Borough of Windsor and Maidenhead are taking steps to reduce carbon emissions created by the construction of the new state-of-the-art facility. Not only will the project provide residents with a new hub for sports and arts but also a place for wildlife to flouish. ‘By procuring the Braywick Leisure Centre project through our framework, the Council is ensuring that the construction of the new building will make use of the local supply chain wherever possible. Wates’ Building Futures programme has already provided 16 residents from the local community life-changing employment opportunities through vocational training courses, ensuring that the project has a lasting socioeconomic impact beyond the build process.